In ChemCatChem, a VIP article appeared from Qingyun Qian, Javier Ruiz-Martinez and Bert Weckhuysen together with researchers from the King Agdulaziz University in Jeddah. The VIP article, entitled ‘Single-Particle Spectroscopy of Alcohol-to-Olefins over SAPO-34 at Different Reaction Stages: Crystal Accessibility and Hydrocarbons Reactivity’, describes the results of their research on in situ synchrotron-based IR and UV/Vis micro-spectroscopy combined with isotopically labeled reactants. The aim of the study was to identify the different hydrocarbon species formed as well as to assess the activity and accessability of individual 50 µm-sized SAPO-34 crystals. 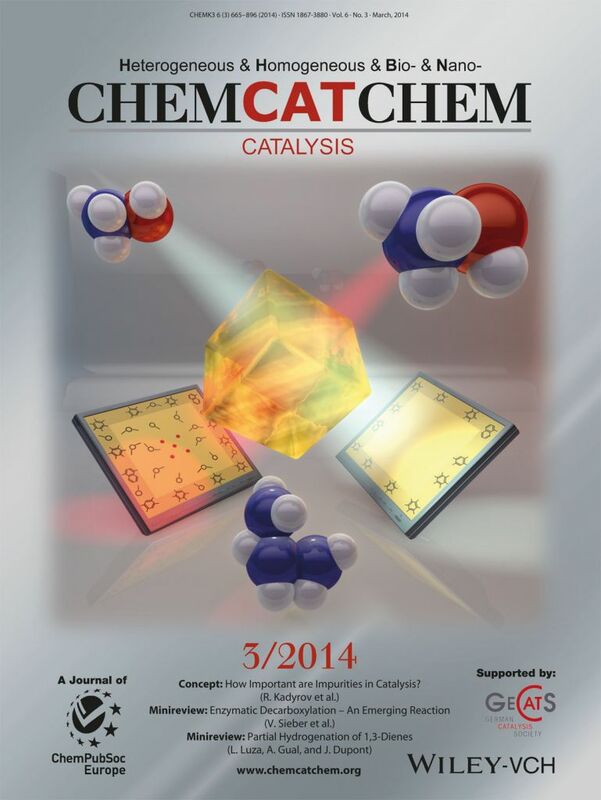 The research was also featured at the cover of the ChemCatChem issue. The artwork shows the concept of synchrotron-based IR and UV-Vis microspectroscopy monitoring a catalytic reaction on a single SAPO-34 crystal and the obained spatially resolved information on the retained hydrocarbon species and crystal accessibility. The front cover resulted in a cover profile with a short interview about the artwork and related research. The researchers used the synchrotron radiation facilities of SOLEIL in Paris, for their in situ IR microscopy experiments. Also other infrared studies of the researchers of the Weckhuysen group are done at the SOLEIL synchrotron, which recently resulted in a Highlight at the SOLEIL website. The Weckhuysen group collaborated with the SMIS beamline for their research on the catalytic conversion of methanol-to-hydrocarbons as technology to obtain gasoline or olefins from alternative feedstocks. The Highlight can be read at the SOLEIL website.